Inspired by a chicken dish served with lemons and capers at the Ristorante Masolino in Panicale, Italy, this version is marinated over night and served with a charred herbed lemon sauce that can also be an excellent accompaniment to roasted fish or grilled root vegetables. To prepare the chicken, run your fingers under the skin of each chicken thigh to create a pocket. Stuff each pocket with 2 sage leaves, 2 slices of garlic and 1 slice of butter. Transfer the stuffed thighs to a large bowl. In a small bowl, stir the lemon zest strips with the smashed garlic, olive oil, chopped herbs and crushed red pepper. Pour the mixture over the chicken and turn to coat. Cover with plastic wrap and refrigerate for at least 2 hours or overnight. Meanwhile make the salsa verde by preheating the oven to 450°F. On a baking sheet, toss the lemon slices with 1 tablespoon of the olive oil. Spread the lemon slices in an even layer and bake for 16 to 18 minutes, until charred on the bottom. Transfer to a cutting board and let cool for 5 minutes. Chop the slices into 1/4 -inch pieces. Leave the oven on. In a mortar, mash the basil, oregano, mint, Parmesan cheese and pine nuts with the chopped garlic, and the 1 teaspoon of salt until a smooth paste forms. Slowly drizzle in the remaining 1/2 cup of olive oil, stirring to create a sauce. Stir in the chopped lemon. Heat a very large ovenproof skillet. Season the chicken thighs evenly with 4 teaspoons of salt; reserve the lemon zest and smashed garlic from the marinade. Arrange the chicken thighs skin side down in the skillet and cover with another large skillet or pot weighted down with a few heavy cans. Cook the chicken over moderate heat until the skin is golden brown and crisp, about 15 minutes. Remove the weight and turn the chicken. Scatter the reserved lemon zest and garlic and the bay leaves, if using, among the thighs. Roast in the oven for about 30 minutes, until the chicken is golden brown and cooked through. Discard the bay leaves. 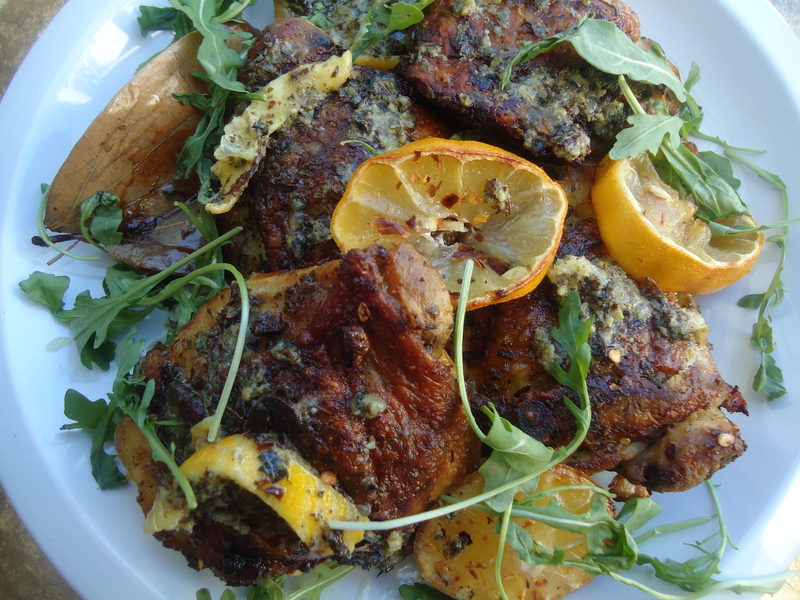 Transfer the chicken to a platter and serve with the salsa verde and scatter with arugula.